Despite many claims to the contrary, as well as much associated hand-wringing, I am firmly of the belief that the hobby is not, in fact, dying - it's just moving. And growing greatly as a result. Sure, I'll be the first to admit - and lament - the dwindling number of local hobby shops. But dwindling numbers of bricks and mortar stores is nothing new - and certainly not limited to our neck of the woods. Folks just choose to shop online more and more. No surprise there. And it's nothing to be afraid of. We have available to us a breadth and depth of products that our Forebears from the Fifties - that "Golden Age of Model Railroading"- could only have dreamed of. On the basis of product variety alone, I'd argue that NOW is model railroading's Golden Age. Aside from product though, is community and that is something that Amazon.com and the other online stores can't provide. One thing that the "first" golden age had (and which was still common until recent years) was the Bull Session down at the local hobby shop. Many of us still remember the great conversations we had and the folks we met while drooling over everything from brass engines to blue boxes. But, again, through the wonder of the interwebs we've got that covered too. Online forums, Facebook, YouTube, etc have all stepped in to fill the community vacuum that would have otherwise persisted in the hobby. And as a result, there's more model railroad community than ever. This is the paid side of a ModelersLife via the Patreon app. I just signed up cuz, frankly, I Need More Model Railroading! Looking forward to listening to my first show. One of the Granddaddys, I first discovered MRR shortly after I got my first iPod and experienced a particularly snowy winter. Let's just say I spent MANY hours that year shoveling my driveway - and it was made bearable by this radio-call-in format. Yes, MRR is a live radio talk show which you can either dial into via Skype, or listen to later when it hits your feed. Some of the old episodes are legendary(ily long), but if you have the time there's plenty to listen to here. Lots of interesting people with some great layouts and many tips to share. 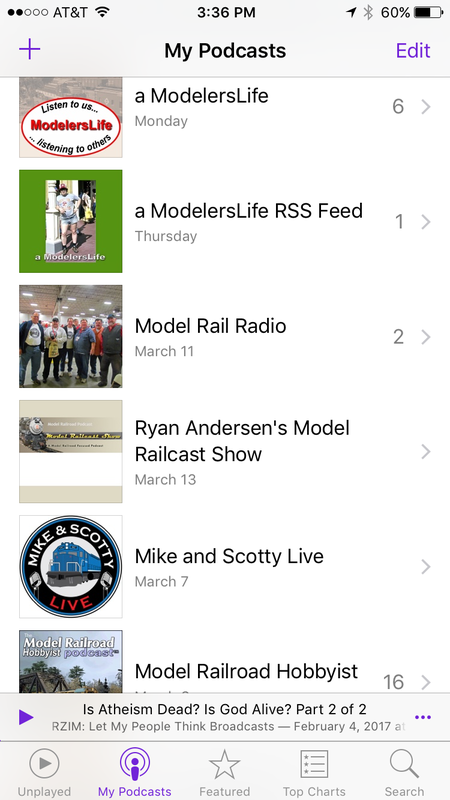 Started by then-newbie Ryan Andersen, this podcast catered to those that were just starting out. Ryan had a knack for asking the questions that many of us have, but were too afraid to ask - and we learned a boatload of great stuff as a result. Ryan was fearless - no question wasn't worth asking. Unfortunately, cancer took him from us way too soon but Craig Bisgeier and Tim Harrison have picked up the baton and continued producing a great show, featuring interesting and informative guests, and still asking the great questions. The old Scotty Mason show was another of those granddaddy shows I picked up during the loooong winter of 2011. It was never produced as often as I wanted - which, to its credit, just meant that the show always left me wanting more. I miss the old crew which included Joe Duckworth, Jimmie Simmons and others, but my two favorites - Scott Mason and Mike Rose - have reworked and rebooted the old show into something possibly even better. Their separate segments were always my favorite, and that of course makes up almost all of the new format. M&SL is still not in my inbox as frequently as I'd wish, but I'm glad they haven't gone away. A distant favorite, only because I seldom get to it after going through all the others. But I'm a huge fan of the MRH magazine and a subscriber to their video channel, TrainMastersTV (um, which brings us full circle since Lionel is a host on TMTV too. Must be something about his name....). During my busy time of year at work though, I'll be on the road more than enough to catch up on the episodes. Can't ever get enough model railroad talk! Speaking of driving, listening to these shows are a perfect way to make a long commute go by more quickly - and along the way, you'll probably learn something new - either a new technique, a new product coming out, or discover a new friend or resource. And if you're concerned about the current state and future of the hobby, I hope you'll check out one or more of these great programs. Without exception, all of the hosts put in a lot of work to produce a quality broadcast - you'll learn a lot and be entertained a bit as well. So give'em a listen - and if you do, and especially if you have a favorite I haven't listed here, let me know in the comments.